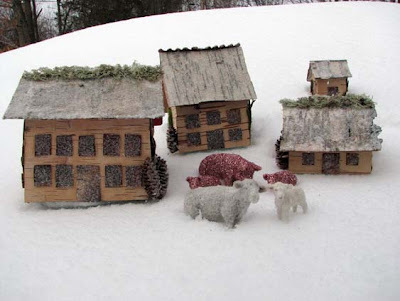 Last year, the month before Christmas, I went slightly craft crazy and made a little birch village full of houses, barns and glittered animals. It was really fun to do – even if there was glitter for months to come all over the house. The best thing was it was an incredibly inexpensive project. I only had to buy crystal clear glitter and had everything else hanging around the house. The people I gave them to loved them with a capital "L."
My family and I have a Thanksgiving tradition. After we eat the turkey at our farmhouse on Thursday, we spend the Friday after Thanksgiving at my sister Nancy’s house in New Hampshire. Quite a while back, we started doing a craft or two on that day, besides eating the leftover turkey in sandwiches. This tradition has become really fun for all of us. Noone stresses over the meals – it’s all leftovers. My mom, sisters and I and all the cousins sit around Nancy’s dining room table and make something. It is probably one of the favorite days of the year for all of us. 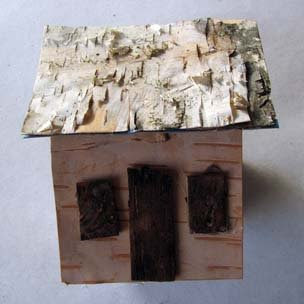 This year I suggested my little birch houses. Everyone said it sounded good and so we all collected the supplies we needed and brought it to Nancy’s. The project was such a success – especially with the teenage girls – that I thought it would be a great tutorial to share with all of you. So here you go – get busy and make up your own little winter wonderland holiday village. 1. Recycled cardboard boxes of all shapes and sizes. Scour your closets and pantry for all different kinds – toothpaste, pasta, Kleenex, candy – anything goes but remember that the size of your box determines the finished size of your project. If you don’t have much storage space, I suggest a very small box like a toothpaste box. 2. Some recycled cardboard in flat sheets for the roof – soda and beer case boxes are good, as are back pages of notepads. FYI - this is a great winter activity for everyone - Julia and I had a great time driving around looking in the woods for birch logs. She did a great job peeling the bark off the rotting trees. 8. Little bits of greenery such as white pine, princess pine. Try to find sturdy greenery – for instance, hemlock drops too quick so avoid that. Fake greenery would work too although I'm not a fan of it. 9. Scissors that you don’t mind messing up. Fold the boxes flat and cut to the desire size you want your house to be. 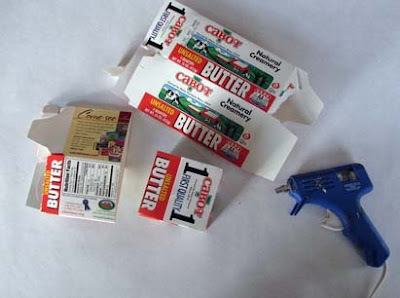 For instance, I cut this butter box in half. I will make 2 houses out of it. After you cut the box, glue the bottom back together so it stands up sturdy again. Remember that a big house will take longer and use up more supplies. The older cousins made some huge houses and sat there for hours gluing them all together. If you want to make a bunch of these for gifts, go for smallish boxes and houses. 2. Cut 2 triangular pieces of cardboard for the trusses that will hold up the roof. 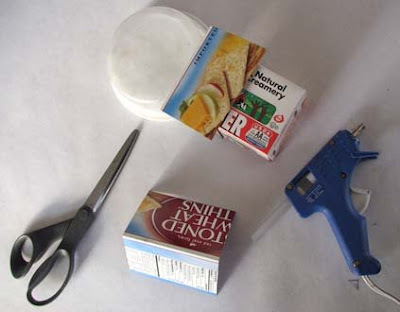 Hot glue them to opposite sides of the box. 3. Cut out your roof out of another piece of cardboard. For mine, I used the natural folds in the cracker box for the peak. I laid it on my house and eyeballed. You can trim it down in size later. Do not glue it to the box. 4. Gather your birch bark. It is very interesting material. 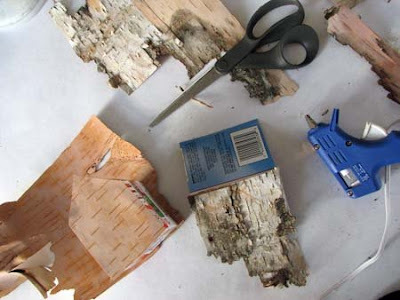 The different layers of the bark split to reveal papery sublayers. The outside is the classic grey birch color. The inside layers are a lovely tannish shade with stripes. The innermost layers on rotted trees is a very dark brown. All these colors give you lots of possibilities. 5. 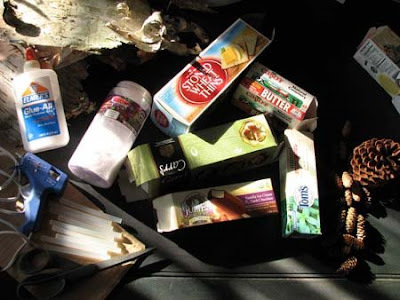 Using hot glue, cover your box with birch bark. Trim to the box shape as it dries. I used the tan color for my houses. 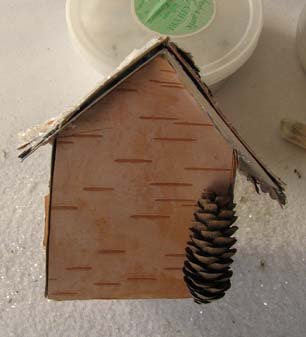 Then cover the roof with the grey outer layers of bark. Here is it fun to use the natural rotted edges for texture and layer different pieces on top of each other. 6. 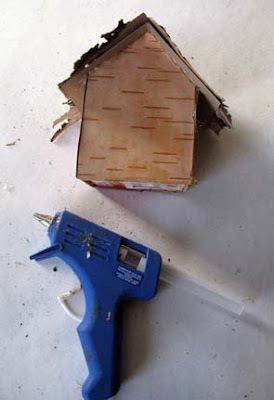 Using hot glue, attach the roof to the bottom of the house by applying hot glue to the trusses. Hold it until it is dry. 7. Cut some of the inner bark which is dark brown into doors and windows. Hot glue them on the house. 8. Clean your workspace of all the brown, shaggy bits. It is time to glitter. Use craft glue and a paintbrush. Paint the roof with the glue. Then paint the windows. Apply the glitter to the roof, windows, and doors. Shake off the excess. The fallen glitter will now be a bit dirty. 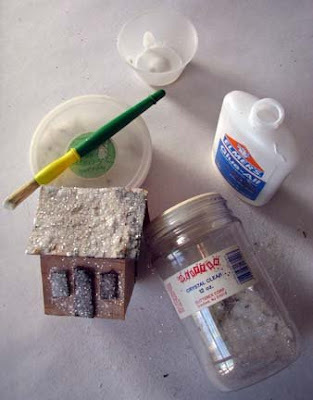 Keep it in a separate container and you can use it again for more of the same project. 8. 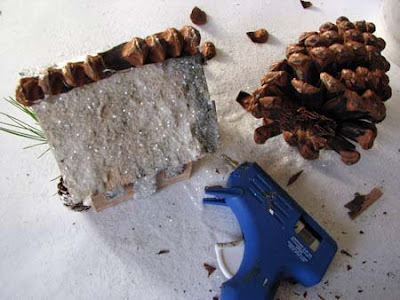 Using hot glue, attach the pine cones and bits of greenery to the sides of the house. 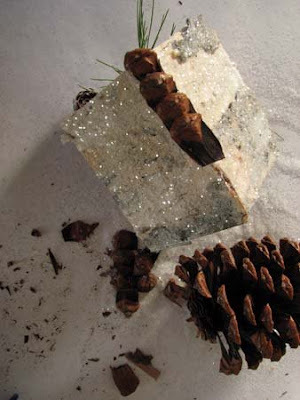 Using craft glue apply some glitter to the pinecones too to make them look loaded with snow. 9. Decorate the peak of the roof. Using strong clippers, cut apart a large pine cone. Use the single pine cone pieces for the peak. 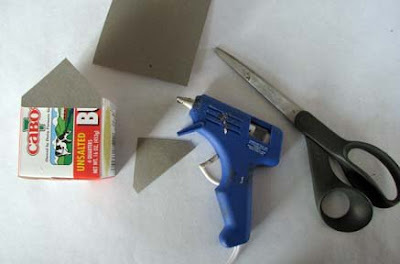 Hot glue them, overlapping as you go. Here's what the roof will look like. You can use your imagination for other roof trims. Last year I used lichen, moss, and silvery pipecleaners to decorate the peak. It's up to you and what you find in the woods. That's it - you are done. You can glue a piece of paper over the bottom of the box and write a message on it. Don't forget to sign and date the box so when you take it out in 20 years, you'll remember way back when. What cute little homemade decorations, don't you think? Build your own little village. I'm adding to mine this year with some more little buildings. Wouldnt it be fun to make an exact replica of your own house? A little FYI. Kids under 11 or so really need help with the project. The hot glue and all the trimming is tricky. My nieces Camille (almost 13), Celia (15) and Olivia (16) really went to town with this project. I called the day after and they were still building houses. What fun! Gorgeous--I love this! I'm going to show my 15-year-old daughter; we could have a lot of fun with this. How cute and if you were to poke a hole in the middle of the roof you could use some twine and make them into ornaments. How awesome would a tree look all decorated with different houses. oh my God! What wonderful things can your hands make!?! Gorgeous! And very nice idea!! I'm in love and we've got more birchbark lying around than we could ever possibly use. I remember when you made them last year and loved them. Thanks for posting. Loooove the little houses. I will definitely be trying these out with my kids and the cousins for our annual Christmas craft day coming up. Thanks for the great tutorial, Kristin. Your blog is so inspiring. I also love Knitting for Baby, one of the best baby knitting books ever in my opinion. just as beautiful this year as last, sadly i have not been able to find decent bark...may have to ask my mum in NH to send some! Love these. I was just looking back through last year and saw these again. I love the idea of making new ones every year to build a village. Thanks for the tutorial. 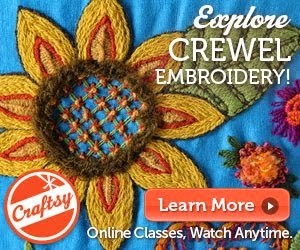 Awesome craft idea! I really enjoy miniatures so these will have to be on my favorite list. BTW, Domestika linked to your blog so I just had to come over and see your tutorial. I'm so glad I did! LOVE!!!! Oh, Kristin, you are da bomb! 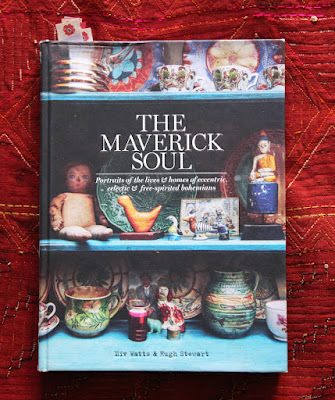 I can't wait to make some of these. Off to hunt for birch bark, which is not so easy to find here down at my elevation! Much easier to locate in the hilltowns, I think. These are so lovely. Thank you for sharing your tutuorial. I'm crazy about these little houses! 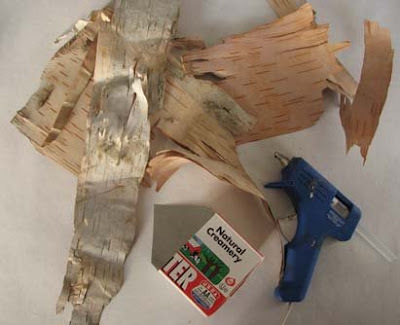 I've got to find a source for birch bark. Oh how wonderful. I have a little son who loves to build (he is 7) He will love this project. Thanks so much for sharing your glitterific design. This will be a nice project for all of my kids to prepare our mantel for Christmas. bless your heart and home! 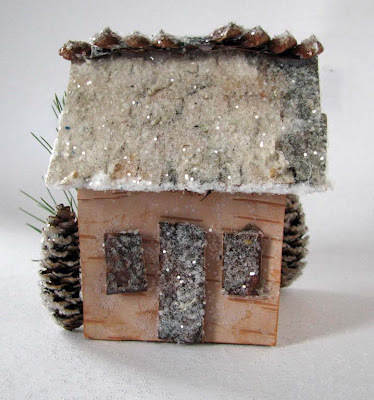 What a charming houses love them & can't wait to make a few of these .Thank you for sharing this with us! These houses are SO wonderful. Thank you so much for sharing them with us! These are so nice. Very pretty and natural looking. Thank you for sharing the project idea.